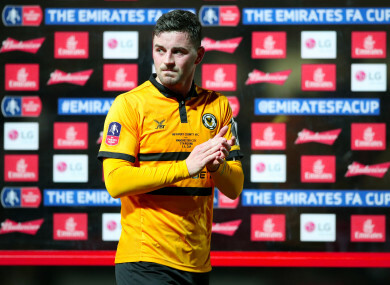 Padraig Amond continued his impressive record of scoring in every round of the FA Cup against Man City. Amond scored a late goal against the Premier League champions on Saturday. CARLOW’S PADRAIG AMOND has revealed he received some personal compliments from Manchester City manager Pep Guardiola after the Newport striker scored against the Premier League champions on Saturday. The League Two outfit held their own for 45 minutes at Rodney Parade, heading into half-time at 0-0 yesterday, however City would come out 4-1 victors during an entertaining second half. Amond halved the deficit to make it 2-1 after 88 minutes, with the former Shamrock Rovers man looking like potentially sparking the most unlikely of comebacks. However late goals from Phil Foden and Riyad Mahrez saw the visitors wrap up a comprehensive FA Cup win. Yesterday’s goal, a clinical finish over the top of Ederson’s head, continued the 30-year-old’s impressive record of having scored in five consecutive rounds in this year’s competition — a feat which earned praise from Guardiola after full-time. “I’m disappointed that we’ve lost the game and we’re out of the cup, but in years to come that’s going to be something I’m very proud of,” Amond said speaking after his side’s defeat. “Also the fact that I’ve scored against the best team in Europe. Pep came over after the game and congratulated me that I’d scored, and when you hear that from someone like him it means a lot. Email “'Pep came over and congratulated me': Carlow striker Amond earns praise from Guardiola”. Feedback on “'Pep came over and congratulated me': Carlow striker Amond earns praise from Guardiola”.